Perhaps because we consumed unlimited mimosas at brunch, MW and I decided to take a stroll over to the new Brooklyn IKEA yesterday. For those of you in the Cobble Hill-Carroll Gardens-Boerum Hill area, it took us about 35 minutes to walk from Smith Street; for the rest of you, it's a short shuttle-bus ride from the Smith/9th Street F station (and a longer, but not awful, shuttle bus ride from the Borough Hall station). In other words, getting there definitely beats the Port Authority bus to the IKEA in Elizabeth, New Jersey. The IKEA itself is very shiny and new, and its location on the Red Hook waterfront is quite scenic, with views of Downtown Manhattan (again, much better than that of the planes taking off from Newark and the other various industrial Jersey scenery). Inside, the store was definitely crowded, but not as bad as we were expecting for a Sunday afternoon, and I thought it was not nearly as bad as Elizabeth. I actually felt a kind of borough pride--the shoppers were a cross-section of ethnicities and ages, much like Brooklyn itself. The setup is the usual IKEA layout--you start on the top floor, with all of its seductive, functional-looking showrooms and big pieces of furniture; the lower floor has lighting, kitchen stuff, textiles, and so on. We were not at all planning on buying anything (famous last words), but I ended up finding the perfect solution to my space-challenged living room: a wall-mountable desk, which matches my IKEA locker console (which everyone and their mother has, but I still love it). We also got a wall-mountable wine rack and some energy-efficient light bulbs. As an environmentally friendly touch, IKEA is charging five cents per plastic bag; otherwise you can buy one of those big reusable shopping bags for 59 cents. The checkout lines, of course, were not the best, but I think it took us about 15 minutes max. We were able to take everything home on the B61 bus, but in grand NYC tradition, you can also have your items delivered (I think prices start at $39). 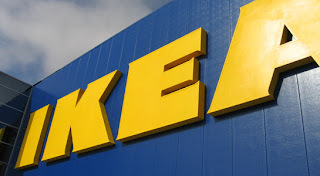 All in all, it's definitely worth a trip, and I especially recommend it over the IKEA in Jersey. The hard part, of course, is putting everything together when you get home.